The Short Version: Live music can provide the perfect atmosphere for memorable dates. One thing concertgoers need to be wary of, though, are ticket scams and the extra precaution they should take when heading to a big event — because, while massive crowds can be exhilarating, those can come with their fair share of chaos. Safeconcerts is an independent music website that helps users securely purchase tickets to shows in Europe without getting taken advantage of by third-party vendors. Through discussion forums, photos, and show reviews, the site also shares a multitude of tips for attendees to keep their wits about them. As a whole, Safeconcerts is a great resource for daters, music lovers, and really anyone who appreciates going to concerts. Concerts can be a lot of fun, and they make for an incredible date or social event. On the flip side, it’s important to think about your safety when you’re buying tickets online and when you’re attending the show. According to a recent article in The Guardian, online ticket fraud went up 55% in 2015. Users on some third-party sites prey on ticket buyers for huge profits, with music fans falling victim to counterfeit tickets or not receiving tickets at all. The folks at Safeconcerts are well aware of the countless concert ticket scams out there, in addition to the potential risks involved once you get to the venue. Their aim is not to take the joy out of going to concerts — it’s to give people a secure place to search for tickets and connect with others while remaining aware of potential dangers at shows. This way, concertgoers can relax and have a good time with friends and dates while they’re out listening to their favorite artists. Safeconcerts strives to suggest events where people can safely come together and create new memories. Photo courtesy of Safeconcerts. 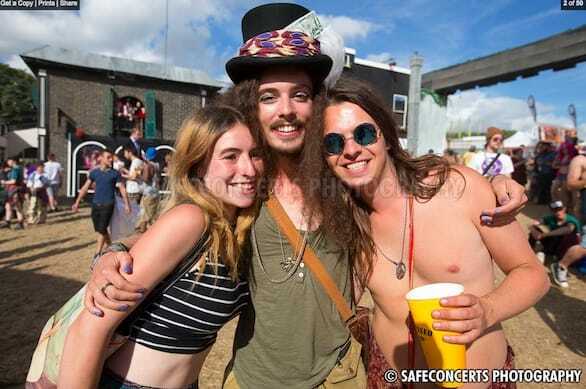 Safeconcerts is owned and operated by festivalgoers and music lovers, just like us, whose priority is making the process of attending and preparing for concerts as fun and worry-free as possible. After all, imagine the disappointment of a couple who makes it to the front of a concert line only to be turned away because the tickets they bought were bogus. Rejecting most forms of advertising, Safeconcerts is an independent site that’s not funded by any outside organization. It’s operated by and designed for people who share a love for live music and want to bring transparency to concert safety and the process of purchasing tickets. 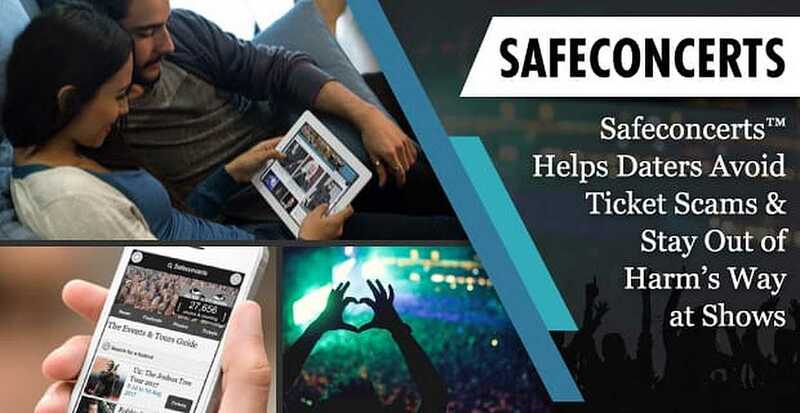 You’ll find up-to-date news and listings about shows, alongside concert and festival photographs, show reviews, and online forums with discussions from Safeconcerts users in regard to various safety and ticketing topics. Having this wealth of resources readily available can be tremendously valuable when preparing for a date or night out with friends. Being armed with solid, verifiable information helps concertgoers relax and enjoy the whole music experience — from when the tickets are purchased to when fans are streaming out of a venue with their ears still ringing from standing too close to the speakers. Safeconcerts provides users with a special section called Be Ticket Safe that was developed in response to the growing number of fraudulent online concert ticketing sites. It includes a directory of legitimate sites for buying tickets, in addition to a list of sites they deem untrustworthy. The goal is to empower people to make informed decisions when hunting down tickets. The folks at Safeconcerts felt this was necessary in order to make it more difficult for those who run fraudulent sites to succeed in their scams. They also want to represent sites that support the music scene and, through ticket sales, are putting the money back into the industry rather than lining the pockets of potentially greedy third-party sellers. Safeconcerts rates sites by how trustworthy they are to help music fans avoid scammers. The Ticket Safe Directory includes a Green List and a Red List. 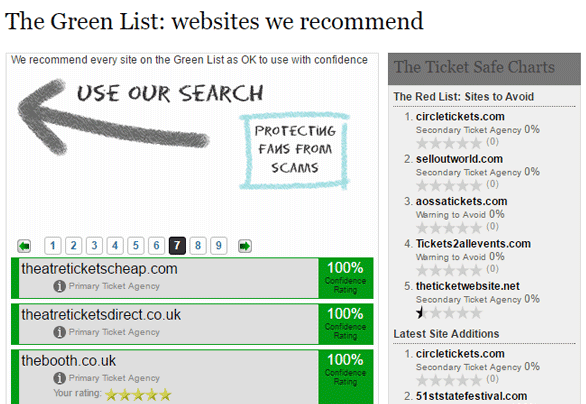 Quite simply, the Green List is made up of online ticket dealers Safeconcerts recommends, while the Red List is made up of websites to avoid. They rate these sites by looking into a specific company’s details, ticketing regulations, and consulting with experts in the industry. Additionally, the Safeconcerts team makes informed decisions hinging on their own experiences with website development, making recommendations based on their findings and encounters. Among Safeconcerts’ live music and festival-related resources is a comprehensive list of events and tours. Users can also find blog posts announcing upcoming shows and festivals, behind-the-scenes photos, concert reviews, and plenty of information from the forums covering how to stay safe. Of course, there’s something to be said for a little spontaneity when planning a date, but that’s the beauty of Safeconcerts. The interface gives you quick access to everything you need to know to keep the experience as stress-free as possible. Live shows are one of life’s most enjoyable pastimes, particularly if you’re a die-hard music lover, and Safeconcerts’ top priority is keeping it this way. The internet is increasing our knowledge about up-and-coming bands and where to see them, due to a growing number of platforms for musicians and fans, but with more options comes more incidences of ticket fraud. Safeconcerts provides all the information you need to avoid these pitfalls and focus on what’s most important — the music and the people you’re with. 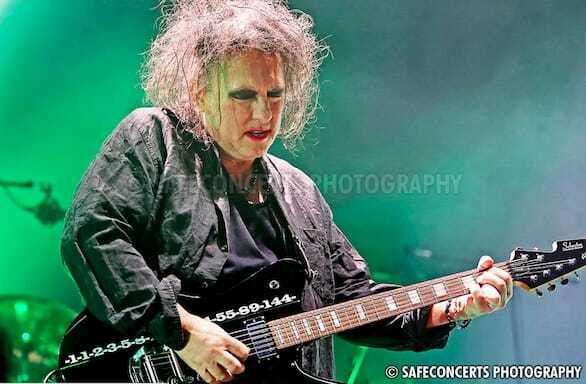 Safeconcerts provides The Cure to your concert blues with a list of trusted ticket sellers. The team dedicates their time and energy to developing the site’s content because of their love of music, and they understand there are millions of folks out there who share their passion for epic live shows. Keeping festivals fun and safe is important because, at the end of the day, we all just want to have a great time with the people in our lives while we dance the day or night away to our favorite artists.